This was Bruce Springsteen’s shot at the big time, after more years gigging than people may have thought and a couple of impressive but not particularly well-known albums. He saw this as pretty much his last chance at meaningful success. Together with producer Jon Landau and the newly-revamped E St Band in to the line up that was the most well-known, he merged a full-on “wall of sound” musical backdrop with his romantic, optimistic yet at times fatalistic lyrics. His songs were often character-driven - “street operas”, featuring an array of names like “Magic Rat”, “Barefoot Girl” and various other non-nickname but heavily featured, such as “Mary” and “Eddie”. The imagery in his songs was almost cinematic. You could see the characters, feel the “soft summer rain”. It really was a masterful piece of work. Hard to know how it could be bettered, certainly musically and lyrically. Despite all these good points, the reproduced sound quality, (as opposed to the actual music) however, has always let the album down slightly in my opinion. It is, however many remasters are done, always somewhat muffled and tinny. For some, though, therein lies its appeal, almost like a “back to mono” thing. I would just like to have heard it sound better, although I appreciate now that will never happen. The opener, "Thunder Road" is a candidate for Bruce Springsteen’s most iconic song of all time (yes, that includes “Born To Run”). This five minute slice of sweeping hymnal majesty sees killer lyrics meshing with a huge piano, harmonica and saxophone backing, and, (for one of the only times in rock music), a glockenspiel, a sound that just blows one away. “It’s a town full of losers and we’re pulling out of here to win”. Indeed. 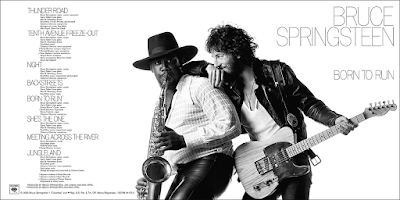 "Tenth Avenue Freeze-Out" is an inspirational, Stax-influenced slab of rock and soul that describes the initial meeting between Springsteen and saxophonist Clarence Clemons - “the change was made uptown and the Big Man joined the band”. A concert favourite for many years, with its singalong horn parts. "Night" 's machine gun drum attack ushers in this frantic “wall of sound” rocker that tells of a blue collar working guy waiting for his weekend night out, a common theme in Springsteen’s mid 70s/early 80s output. The lengthy, slightly sombre "Backstreets" is a bleak organ and guitar driven lament and a final climax repeats the line “hiding on the backstreets” many, many times. It doesn’t detract from it though, and the song is most evocative and atmospheric. Now we get the "one everyone knows". No introduction needed. Session drummer Ernest “Boom” Carter’s rattling drum introduction sends us speeding down the freeway in search of a “runaway American dream” with Wendy in the passenger seat. The youthful optimism of "Born To Run" lives forever. "She’s The One" is a shuffling Bo Diddley/“Mona” groove backs the album’s most obviously romantic track. It contains a supreme saxophone solo from Clarence Clemons at the end. "Meeting Across The River" provides a distinct change in mood. Jazzy trumpet backs a mournful Springsteen vocal concerning the tribulations of a small time criminal and his hope he will “throw that money on the bed”. This is the often-forgotten song of the album and makes for an interesting listen because of it. Finally, the album ends with "Jungleland". The album’s “A Day In The Life”. A monumental closer, an atmospheric slow-building piano intro, a great guitar solo and Clemons’ extended jazzy saxophone solo before Springsteen’s poetic finale. "The poets down here don't write nothing at all" - an overblown lyric in many ways, but all of these type of lines just suit this album perfectly. A nod to the iconic nature of the cover too. Unbelievable as it sounds, in 1975, a white man and a black man together in friendship on the cover was not a regular occurrence.